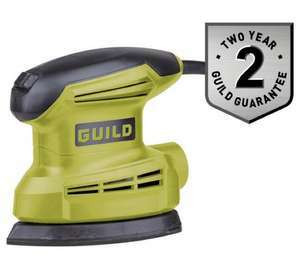 The Guild Detail Sander features a 135 watt power output, ideal for preparing doors and windows prior to painting or for fine sanding of small, flat surfaces. The handy dust box collects any debris, allowing you to get the job done quickly and efficiently with minimal mess. The solid plastic base features hook and loop sheet fastening to ensure the sanding sheet is held securely in place. Whilst the soft palm grip enhances comfort and accuracy throughout repetitive tasks. All Guild power tools are built to last and come with a free 2 year guarantee. So whether you are using a drill to put up a shelf or using a mitre saw to cut decking, you know with Guild power tools the products are built to last. Accessories included: 1 dust box, 1 vacuum adaptor. Additional features: Hook and loop system. Max no load speed 12000mpm. Good price but still got the black and decker mouse sander never out the box from a deal i seen on here 2 yrs ago.Goes well with the unused bosch drill i got on a deal this year.Hate this site sometimes. Good price but still got the black and decker mouse sander never out the …Good price but still got the black and decker mouse sander never out the box from a deal i seen on here 2 yrs ago.Goes well with the unused bosch drill i got on a deal this year.Hate this site sometimes. How much are sanding sheets for this tool? Reviews suggest you can't get the sanding pads with holes aligned so the dust extraction works. Shame. Anyone know any different? Needed one of these so thanks.